Who doesn’t love a rice krispie treat? 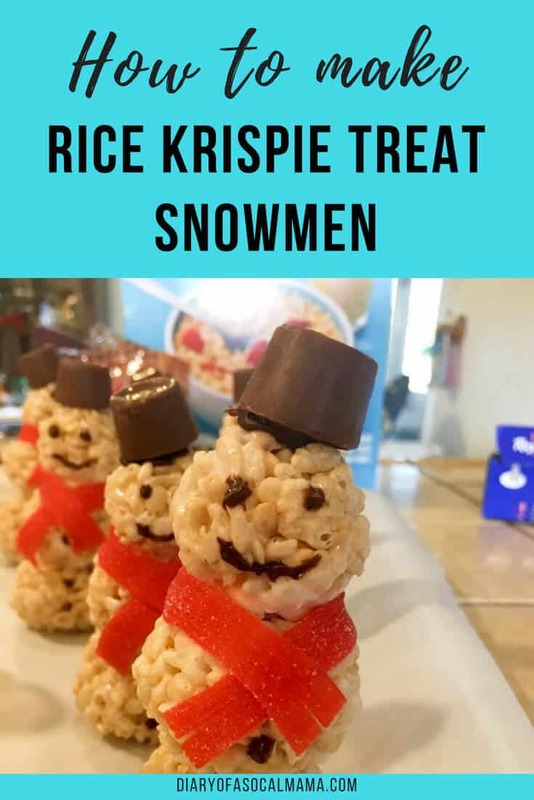 These ones are shaped into snowmen to create the perfect wintry treat. 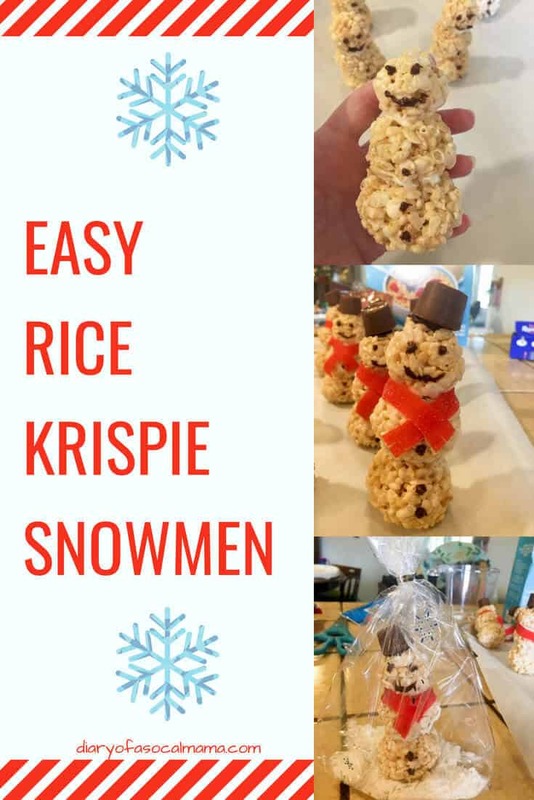 These snowmen are so fun to make and pretty easy to make as well. Make them yourself or use as a fun project for the kids. They are perfect for classroom gifts, workplace gifts, or even a fun alternative for a holiday cookie party! I was able to make 12 snowmen, yours may vary depending on how big your snowmen are. Before you start cover 3 baking sheets with parchment paper. Once it’s all well mixed and the cereal is coated let it sit for a minute until it’s cool enough to touch with your hands. 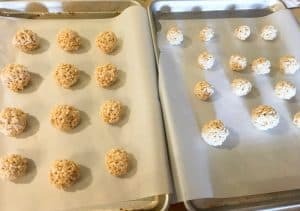 As you finish each ball set it on your parchment paper. Press down on the balls a bit, especially the larger ones that will be your base. This will flatten it slightly helping to keep your snowmen from tipping and giving you a better surface for when you start connecting your pieces. Now you’ll need to let these sit for a while so they can cool and start to firm up. Once they are cool it’s time to start building your snowmen. Pour about half a bag of white chocolate chips into a microwave-safe bowl and heat for 45-60sec. Remove and give it a good stir. Heat for a few more seconds if necessary. Don’t overheat it or the chocolate will start to cook and harden. It doesn’t have to be liquidy, just soft. Pick out a base for your snowman and set it nearby. Next, pick pieces for the middle and head of the snowman. Dip the middle piece into the white chocolate and then press it gently onto the base. Use a little bit of pressure but not so much that it squishes your pieces out of shape. Hold for a few seconds. Repeat with the head of your snowman. Repeat until you have used up all of your pieces. I was able to build 12 snowmen. Let the chocolate firm up. You can even slide the trays into your freezer for a couple minutes if you want. If you’re planning this as a kids activity I would prep to here before setting the kids loose to decorate their own snowmen. Pour about half a bag of semi-sweet or dark chocolate chips into a microwave safe bowl and heat until melted as you did above. Use a toothpick dipped in chocolate to paint on the eyes, buttons, and mouth of your snowman. You could also use a coffee stirrer or even use a pastry bag to pipe the chocolate on if you want. Let the chocolate firm up before moving forward. I would definitely suggest sticking them in the freezer to speed up the process. Wrap the scarf gently around the neck of the snowmen and press gently to connect the two ends where they cross. The stickiness of the candy should allow for this. I also pressed the candy gently against the rice krispie treat to help it stay in place. Last, but not least, is the hat! I tried a couple candies but found that rolos worked best for the size of my snowmen. It’s best to use the individually wrapped rolos and stick them in the freezer for a bit before you work with them. Dip the bottom of the rolo into your chocolate you have left from making the faces and buttons and press the hat gently but firmly onto the top of each snowman. Hold for a few seconds to get a good hold and then gently remove the rest of the foil from the rolo. Optional: If you want to use this as a kids activity you can give them mini m&ms, mini chocolate chips, or other tiny candy to use to make a face and buttons instead of just drawing it on with chocolate. They may have to dip the candy into the chocolate in order for it to stick to the snowman. Want to make your snowmen into a pretty present? Grab some cellophane treat bags at the dollar store. I opted for simple clear ones so that you can easily see the snowmen. I added a few snowflake stickers to jazz them up a bit without hiding my adorable snowmen. Fill each bag with a little bit of coconut flake so it looks like snow. Just add enough to cover the bottom, if you add too much your snowmen will tip right over. 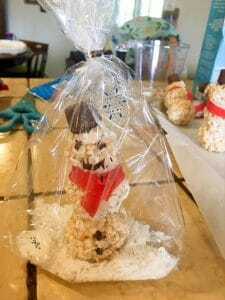 Gently place each snowman into a bag and tie it up with the twist tie the bags come with or a pretty, festive ribbon. Your snowmen are now ready to be gifted and devoured! Get them to their new homes before they melt away!